Michael "Doc" Emrick (born August 1, 1946) is an American network television play-by-play sportscaster and commentator noted mostly for his work in ice hockey. Emrick is currently the lead announcer for NHL national telecasts on both NBC and NBC Sports. Among the many awards he has received is the NHL's Lester Patrick Award in 2004, making him the first of only five to have received the award for media work, and the Foster Hewitt Memorial Award by the Hockey Hall of Fame in 2008. He has also won four national Emmy Awards (the only hockey broadcaster to be so honored with even one), and on December 12, 2011 became the first member of the media to be inducted into the United States Hockey Hall of Fame. Emrick earned a B.Sc. in speech from Manchester University in 1968, a M.A. in radio/television from Miami University in 1969. He then received a Ph.D. in Communications (radio/television/film) from Bowling Green State University in 1976, where he got his nickname "Doc". Emrick taught speech and broadcasting at Geneva College in the Pittsburgh suburb of Beaver Falls from 1969–71 and got his first experience of the NHL covering the Pittsburgh Penguins as an unpaid correspondent for The Beaver County Times newspaper. Emrick has been sportscasting professionally since 1973 when he was hired by Port Huron Flags' GM Morris Snider to do play-by-play on WHLS radio and public relations for the IHL team. In 1977 he took on the same two roles with the first year AHL Maine Mariners for three seasons (broadcasting that club's Calder Cup championships in both 1978 and 1979). Emrick then served as the Devils first voice in New Jersey, arriving for the 1982–83 NHL season, and stayed there until 1986. Emrick wore several hats in the 1980s working for the Philadelphia Flyers. He was a spot announcer for Flyers home broadcasts from 1983–86, then was an in-studio analyst between 1986-88 when not covering national games. Emrick was promoted to the lead play-by-play slot for both local TV and cable for the team in 1988, remaining with the Flyers until the end of the 1992-93 season. For four of those years, Emrick was paired with former NHLer and national hockey broadcaster Bill Clement. In 1993, he returned to the Devils to replace Gary Thorne, and continued to be the Devils's voice until July 2011. He announced the Devils' 1995 Stanley Cup victory, alongside color commentator John Davidson for the national United States broadcast on Fox. Emrick has also done play-by-play for CBS, NBC (and its cable network subsidiary NBC Sports Network, formerly OLN and Versus), ABC, TNT, ESPN, Fox, CSTV, SportsChannel Philadelphia, PRISM, Fox Sports Net, and others. Emrick was the lead play-by-play announcer for The NHL on ESPN from 1986–1988. His first national over-the-air television work came in 1992 doing ice hockey at the XVI Winter Olympic Games at Albertville, France, for CBS. Emrick became the lead play-by-play announcer for the NHL on Fox Game of the Week, calling regular-season games and Stanley Cup Finals from 1995 to 1999 including 2 games between New York Rangers at New Jersey and Philadelphia at Pittsburgh alongside color commentator John Davidson for NHL on Fox. After Fox relinquished the NHL broadcast rights to ABC, he became a regional announcer for NHL on ABC from 2000–2004. He could only call select playoff games at the time, but did file reports for ABC Sports and ESPN's Stanley Cup Finals coverage. 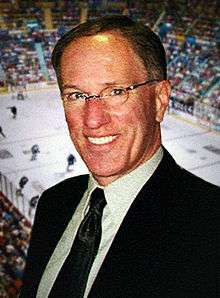 Since the 2005–06 NHL season, Emrick has been the lead play-by-play announcer for the NHL on Versus (formerly The NHL on OLN) and the NHL on NBC, and since 2008, has served as an overall host of the telecast. He calls the top Conference Final and the entire Stanley Cup Finals for both networks. He has called games in 11 Stanley Cup Finals on TV (for ESPN, Fox, Versus/OLN, and NBC). He has also called eight NHL All-Star Games for Fox, Versus and ESPN. He called the 1996 World Cup of Hockey for the Prime Network and the 2004 World Cup of Hockey for ESPN. Emrick has worked five Olympic Games for NBC. He has also worked during the Olympics twice for CBS and once for TNT. For NBC, he called water polo in the 2004 and 2012 Summer Olympics, and men's and women's ice hockey at the 2006, 2010 and the 2014 Winter Olympics alongside Eddie Olczyk. He also called some National Football League and men's NCAA basketball tournament games while at CBS, and called the National Lacrosse League All-Star Game and Championship Game while at NBC. 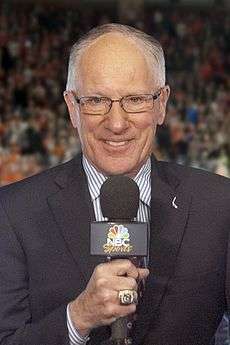 On July 21, 2011, Emrick announced that he was leaving the New Jersey Devils to work exclusively for NBC Sports. On May 5, 2014, EA Sports announced that Emrick will provide play-by-play commentary for NHL 15 along color commentator Ed "Eddie" Olczyk and ice level analyst Ray Ferraro. Emrick won the 1997 National CableACE Award for best play-by-play announcer. In 2004 he was one of three winners of the Lester Patrick Trophy presented annually by the NHL for "outstanding service to hockey in the United States". This was followed four years later when the Hockey Hall of Fame awarded him the 2008 Foster Hewitt Memorial Award for outstanding contributions to hockey broadcasting, and on January 30, 2009, Emrick was honored for winning the Hewitt Award by the New Jersey Devils with "Mike 'Doc' Emrick Night" before a game at the Prudential Center. After being previously nominated in both 2008 and 2009, in 2011 Emrick became the first hockey announcer to win a national Sports Emmy Award for "Outstanding Sports Personality - Play by Play" for his work on the "NHL on NBC" the previous year. Emrick won the national Sports Emmy in the same category again in both 2014 and 2015. He had previously won five New York Regional Emmy Awards for his play-by-play work of New Jersey Devils telecasts on the MSG Network. On February 24, 2012, Emrick was again honored by the New Jersey Devils in a pre-game ceremony for his 21 seasons doing play-by-play for Devils' games. Emrick won the NSSA Sportscaster of the Year award for 2013. The award is given out by the National Sportscasters and Sportswriters Association. Emrick received the award in a ceremony on January 9, 2014. On December 20. 2014 Sports Illustrated named Emrick as its 2014 sports media "Person of the Year". Resch: "...and Scotty [Clemmensen] was tellin' me this morning that he likes his new pads like that...the puck should rebound almost like a quarter off of a balloon, Doc. Emrick: ...But you don't spend too much free time throwing quarters at balloons, Mr. Resch, do you? Other recurring comedic bits arise during games. After Emrick or Resch analyzes the play of a goaltender, if Emrick feels that Resch is sympathizing towards the goalie due to his former play at the same position, Emrick will add a sarcastic comment which talks about the glory of goaltending and how they are "by far" the most important players in the game. Another comedic bit that is shared between the Doc and Chico is when Doc will ask Chico where a particular town or city in Canada is located when they talk about a player's home town. In the event of an odd play or bounce of the puck, Doc has cited "the unseen hand," as the culprit, which always gets a laugh from Chico. However, Emrick's most famous and unique saying is "my goodness" usually being said when there is a remarkable save by a goaltender or when there is a sequence of plays having high amounts of "energy" on the ice. Emrick's knowledge of the game of hockey has been deemed "encyclopedic", and he is known for his eloquent vocabulary. He employs an unusual vocabulary to describe play-by-play action, referring to a goaltender's equipment as "paraphernalia", for instance. Often, during line changes or zone clearings, Emrick will discuss interesting facts about a player's personal life, hockey records, or contributions to sports. In addition, sportswriter Peter King has praised Emrick by saying "Doc Emrick is one hell of a hockey announcer. If hockey were big in this country, he'd be what Jack Buck used to be." Emrick is a founding member, and still president of, the NHL Pronunciation Guide, which is used as a guide for all NHL broadcasters for some of hockey's most difficult names. He is Vice President of the NHL Broadcaster's Association, and he is also a member of the Hockey Hall of Fame Selection Committee. Emrick also hosted a weekly podcast on iTunes called "Emrick's Angle" which offers his current thoughts on the NHL. Emrick is an avid Pittsburgh Pirates fan. He grew up listening to Bob Prince on KDKA Radio. He attended a game in which Garrett Jones became the first Pirates player to hit a home run into the Allegheny River on the fly. On June 11, 2014 he was interviewed on NPR's All Things Considered by Melissa Block discussing his career and style. In 2016, Emrick attended Pirates spring training in Bradenton, Florida and called a few innings of one game on television and radio with Pirates broadcasts Greg Brown and John Wehner. As previously mentioned, on July 8, Emrick called his first MLB regular-season game at PNC Park when the Pirates hosted the Cubs for MLB Network with Bob Costas. The Pirates won the game 8-4 with Emrick calling some of the action. When his NBC broadcast schedule permits, Emrick travels to Hershey, Pennsylvania, each year to announce the Hershey Bears' Hall of Fame inductees. Emrick is a cancer survivor, having been diagnosed in 1991. Doc lives in St. Clair, Michigan with his wife Joyce. ↑ Mike G. Morreale (Dec 12, 2011). "Dean of American hockey announcers enters U.S. Hall". NHL.com. Retrieved Feb 24, 2012. 1 2 "Emrick joins NBC/Versus exclusively". July 21, 2011. ↑ "EA SPORTS NHL 15 Starts a New Generation of Hockey Videogames This Fall". EA Sports. 2014-05-05. Retrieved 2014-05-17. 1 2 3 4 Mike Emrick Bio NBC Sports Group "Pressbox"
↑ Mike G. Morreale (Feb 24, 2012). "Devils honor legendary announcer Emrick on Friday". NHL.com. Retrieved Feb 24, 2012. ↑ Kasan, Sam (25 March 2011). "Pittsburgh is Special to Hall of Famer Emrick". pittsburghpenguins.com. The Pittsburgh Penguins. Retrieved 2 December 2015. ↑ Allen, Kevin (June 6, 2012). "Hockey voice Mike Emrick has passion for Pirates". USA Today. ↑ ""DOC" EMRICK TO EMCEE HALL OF FAME NIGHT". hersheybears.com. Hershey Bears Hockey Club. Retrieved 2 December 2015. ↑ Crechiolo, Michelle (22 March 2010). "Emrick to call 3,000th pro game Monday". Detroit Red Wings. Archived from the original on 3 May 2014. Retrieved 16 July 2014. "Hockey's Great Voices Echo Through Generations" at NHL.com. Retrieved 10–20–06. Mike Emrick - Lead NHL on NBC Play-by-Play Announcer Profile.